Public Records Office destruction was a deliberate Act. 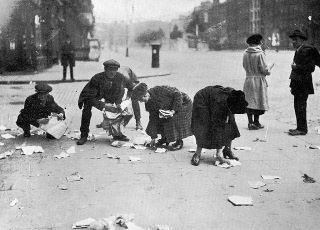 In a notoriously brutal conflict, the Irish Civil War, where all sides committed atrocities, one of the most notorious, simply because it was so needless and so callous, was the destruction of the Public Records Office of Ireland at the Four Courts. The PROI, the forerunner of the National Archives, was located behind the Four Courts. It contained priceless Irish records – from mediaeval Irish manuscripts to a thousand years of treaties, wills, family records, church registers and all the surviving 19th century census returns, as well as ancient maps. 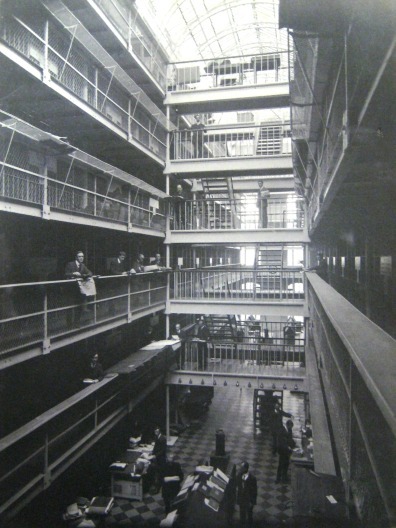 Major renovation work in previous decades had made the PROI one of the most secure places in Ireland for records, that were so well protected that it was almost impossible to destroy them except from inside the storage areas. For that reason, with unfortunate timing, many parochial registers had been moved for safe keeping into the building in the years directly preceding the destruction. Some had arrived only days earlier. The scale of the explosion that wiped out so many Irish records was so large it was heard up to 20 miles away. The priceless collection was effectively incinerated. The force of the explosion was so strong that fragments of mediaeval documents were found miles away from the site. They fell in the greater Dublin area as far away as Dun Laoghaire and Fairview strand. The scale of what happened still remains a very sore point for historians. Nearly a century later we are all still trying to assemble bit and pieces to fill the gaps from copies, indices, scribbled notes of people who consulted the collection. A small number of copies of some documents thought lost forever have turned up where someone in the previous decades had copied by hand some document when they used the PROI. The deliberate destruction of national libraries, museums, and cultural artifacts in war is now seen as a war crime under the The 1954 Hague Convention for the Protection of Cultural Property in the Event of Armed Conflict. Not that this stops such destruction – 400 years of civil records were destroyed deliberately with the setting fire of Oriental Institute in Sarajevo in May 1992. In the National Library in the city in August 1992, 90% of the collection, over one million objects, was destroyed in a deliberate attack during the Siege of Sarajevo, wiping out priceless and irreplaceable records. THE INTERIOR OF THE PROI – GIVING SOME IDEA OF THE VAST NUMBER OF DOCUMENTS IT HELD. The issue of who was responsible for the destruction of Ireland’s Public Records Office remains controversial. The National Army and key state figures claimed the Anti-Treaty IRA deliberately destroyed the archives as an act of revenge against the Free State. 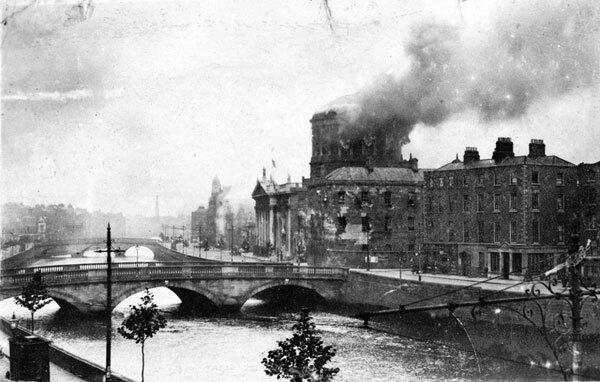 The Anti-Treaty IRA blamed the National Army’s bombardment of the Four Courts. Two enormous mines were placed in the PROI and two in the Land Registry Office, to be set off if attacked. Leaders of the garrison ordered that the PROI be mined for possible destruction. That priceless documents and ledgers, including the 1821 census, the oldest complete census then in existence in Ireland, were ordered to be used to block up windows in the Four Courts and to be used to by the Anti-Treaty IRA side to fire from, along with mediaeval manuscripts. The few surviving documents were bullet-scarred. Senior leaders on the anti-treaty side denied all of this, though some indicated that it may have happened but if so entirely at the decision of Rory O’Connor and was not known in advance by senior leaders outside the garrison. Others claimed that the mines were set off by Free State attacks. However experts dismiss the claim that they were triggered off by the bombardment. Mine technology had advanced by the First World War to the extent that mines could only be triggered off by deliberate action not those who installed them and not by the effects of bombardment. It is thought extremely unlikely given the size of the mines the the garrison would have used mines that could have been accidentally triggered, as an actual triggering could have wiped out the garrison itself and the garrison would hardly have put themselves in a position where they could be wiped out by their own mines. Eoin MacNeill and Seamus Ó Ceallaigh ( the latter strongly anti-treaty) were allowed into the Four Courts to plead with Rory O’Connor. Ó Ceallaigh’s grand-daughter was told that when plans O’Connor had to tunnel out of the Four Courts proved impossible he decided to almost literally ‘go out with a bang’ by blowing up the Records Office ‘as a gesture of defiance’. Ó Ceallaigh himself, as a strong anti-treatyite, was horrified and disgusted and never forgave the Anti-Treatyites for what was seen as the deliberate destruction of the records of the Irish nation – including all the names of those who died in the famine. “What remains of the building is a mere ruinous shell. The roof, which was partly glass, and partly slates, has fallen in, the coping of the whole of the east side has fallen, and there is a fissure several feet wide extending from the top to the ground floor level. Though their accounts were challenged by MacNeill, Ó Ceallaigh, various members of the garrison and others, leaders on the anti-treaty side continued to insist that they had not deliberately intended to set off the mines and there had been no intention in advance to do so. And they were right. No contemporaneous records confirmed the existence of a plan to detonate the minds. Some time ago, during renovations in a house linked with a leading Anti-Treatyite, workmen found hidden under the floorboards a pile of documentation relating to the civil war. One letter in what is called the Joe Clarke collection and which was donated to the Bureau of Military History (who interviewed survivors and participants from the period 1913-21 and has an extensive collection of documentation) shows that one senior anti-treaty figure OUTSIDE the Four Courts was indeed aware of the plan to blow up the PROI and had actually authorised it IN ADVANCE. Traynor’s letter makes it clear that the Anti-treaty garrison had the intention to blow up the PROI and Land Registry. It was not something that was spur of the moment and not something that only happened because bombardment had set off the mines. It was so planned that Traynor, who had been on O’Connell Street, knew of it and had authorised it – indeed instructed them to do it. The letter, which was dated before the destruction, incriminates the Anti-Treaty garrison under O’Connor in planning to destroy the Public Records Office. It confirms the accounts of MacNeill and Ó Ceallaigh about the destruction being planned. Whatever about the rights and wrongs of the treaty or of occupying the Four Courts, there can be no doubt but that the destruction of the Public Records Office was senseless, pointless and disgraceful. It robbed future generations of their heritage and wiped out priceless records of a millennium of Irish history. If done today, Traynor and O’Connor would face international prosecution for war crimes just as those who authorised the destruction of the Oriental Institute and the National Library in Sarajevo are being.